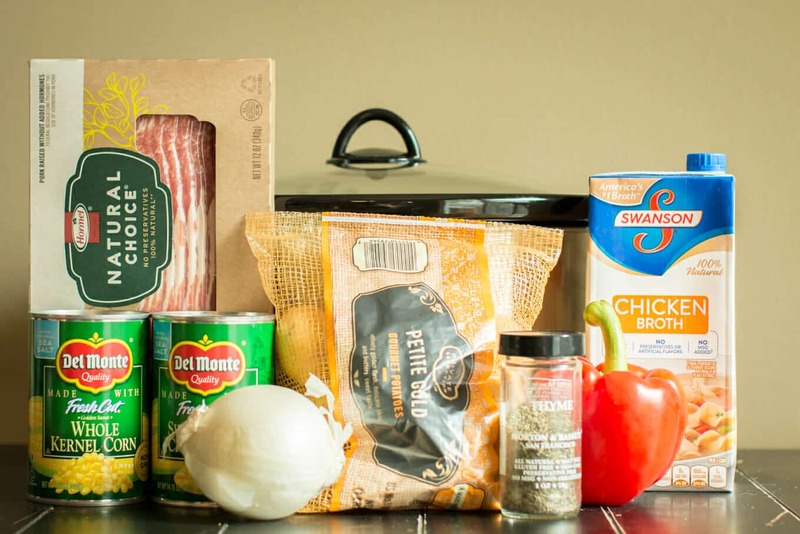 Slow Cooker Maine Corn Chowder is sweet but smoky from the bacon. This is a dump and go recipe! So easy. 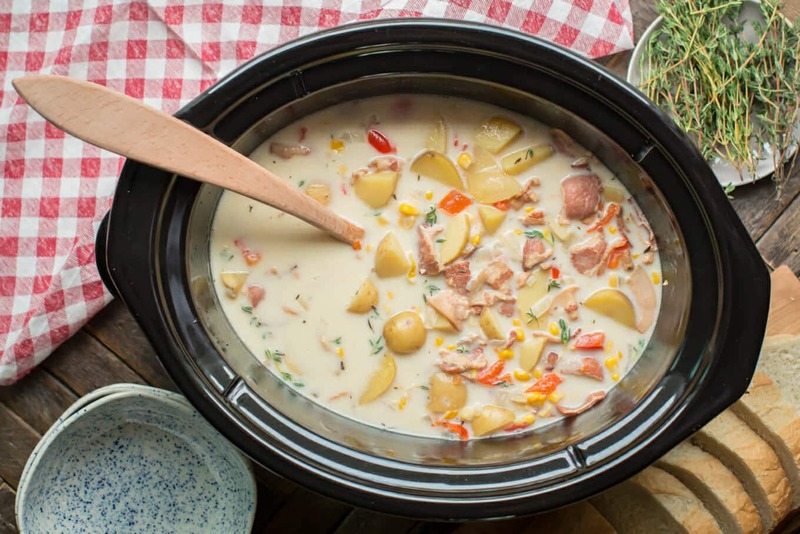 This Maine Corn Chowder was easy to make, it’s one of those dump and go recipes. 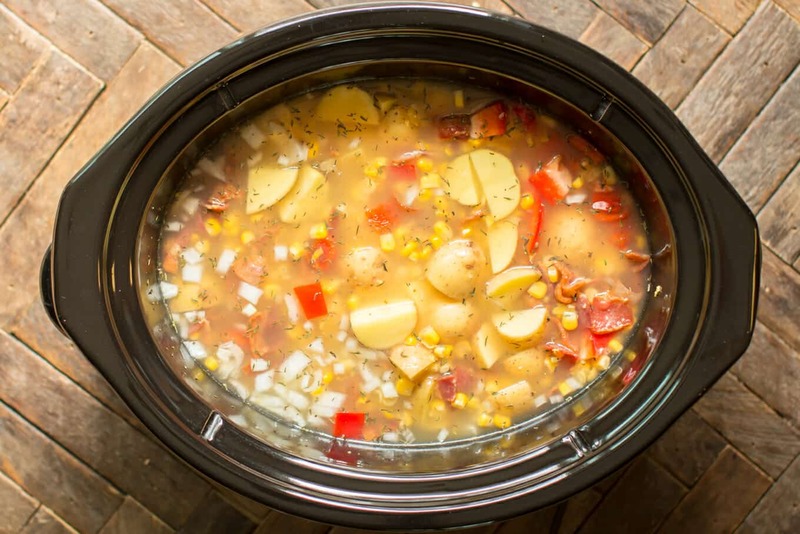 This soup is made with a can of creamed corn and a can of regular corn, I also added diced Yukon gold potatoes to make it heartier. If it was summer time I would have used fresh corn, I can’t wait to try it that way too. I want to apologize if you were here on the blog this weekend and couldn’t leave a comment or access a recipe. My blog’s theme decided to crash, and couldn’t be updated. I spent 3 days and nights adjusting this new look of the blog. I hadn’t planned on changing the look of the blog since I spent 3 years getting everything right, but I do think the new look of the blog fits my personality well. 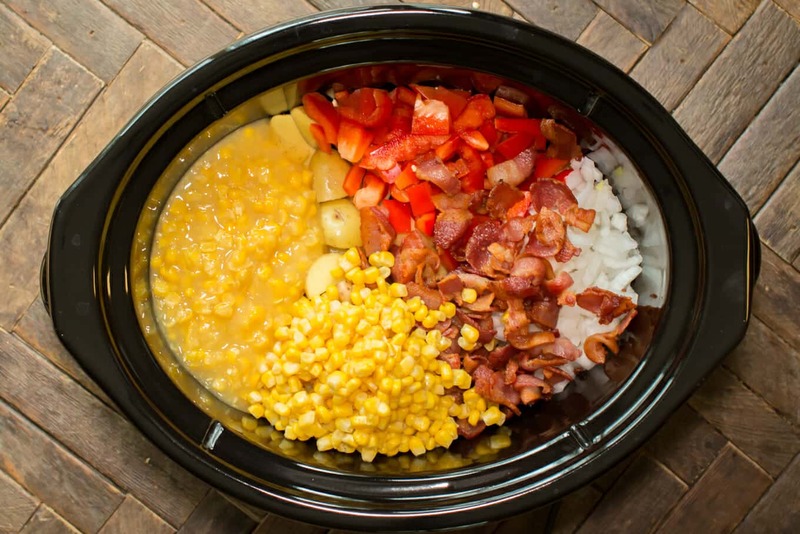 Here is my YouTube video about how to make this Slow Cooker Maine Corn Chowder. You can follow me on YouTube, here. 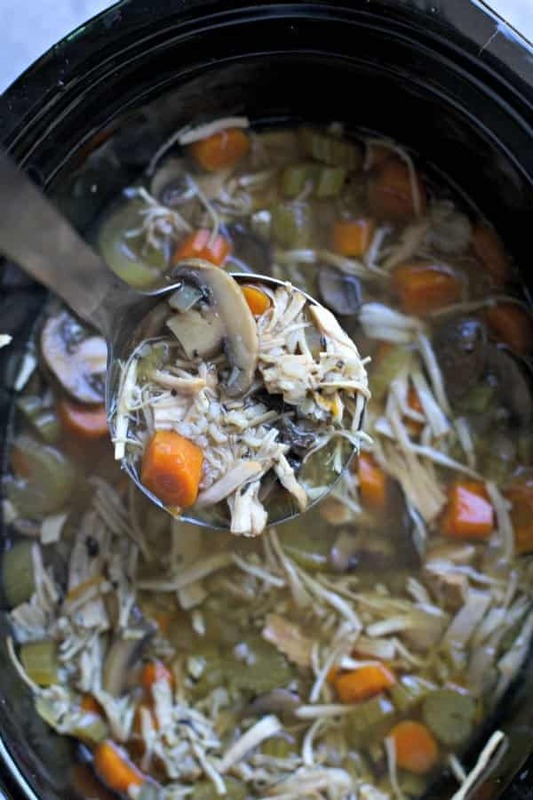 Add every everything except the cream into a 4-quart or larger slow cooker. Cover and cook on LOW for 8 hours. When the cooking time is done, stir in the cream. Add the salt to taste if needed. Serve and enjoy! Note- I did not find that this recipe needed any added salt with the bacon and the chicken broth. If needed, add to taste. This recipe size feeds about 8. The nutritional value below is for 1/8 of the recipe. If you require a special diet, please use your own calculations. This soup looks delicious, and I love your new blog theme! Hi Sarah! I stumbled upon your blog today because of a Yummly thread and really loved your food photography! 🙂 Adding you to my Bloglovin feed so I can keep in touch. Lovely work! Yes please. 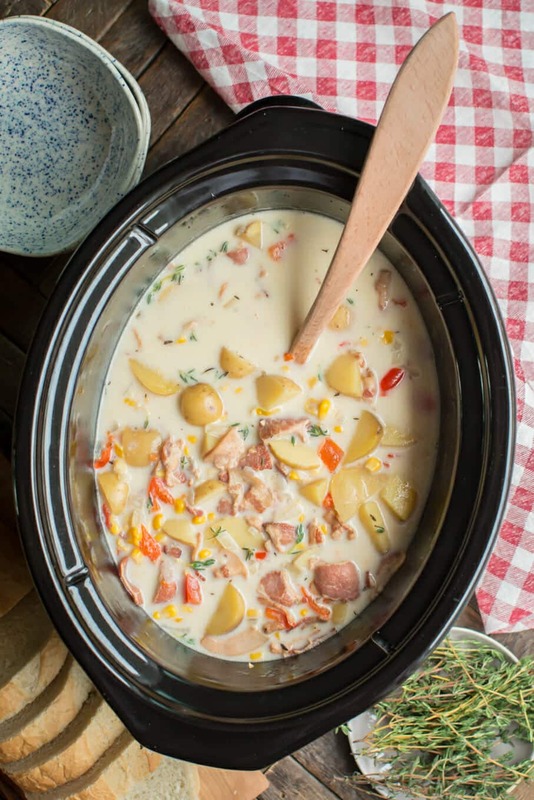 This chowder looks perfect for a satisfying meal. This looks delicious and easy Sarah! Love it! OH my! That looks like a good bowl of soup right there! If I didn’t have Taco Soup already working in the slow cooker that would be what is for dinner tonight! Thank you! The blog and soup both look great!! I’ll definitely have to try this recipe for dinner someday! Yum! Time well spent even if it wasn’t planned! Your blog looks great! 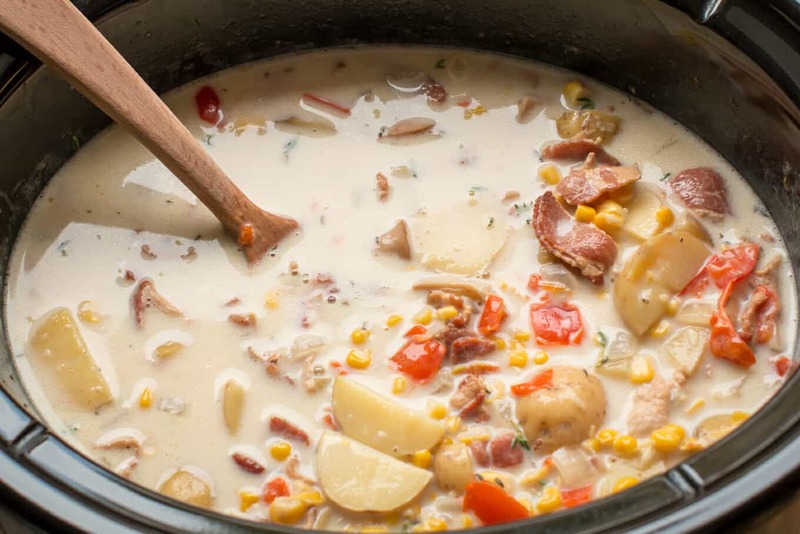 Love that you added chunks of potato to this chowder. I just love a good corn chowder! 🙂 Perfect for cold winter days. You know I love chowder 🙂 Love your new theme too! I made this overnight for the morning. I forgot to buy bell pepper so maybe that’s why, but this doesn’t have much flavor so I had my own seasonings. If you have finicky girls, use imitation bacon bits. You’ll have a pretty pink soup. I made an oops & used jarred imitation bacon bits instead of real bacon (cook in nursing home at the time) and the pickiest eater had 2 bowls and wanted more! Btw, this corn chowder looks tasty! It’s almost exact to my mom’s, and she was raised in Maine. Haha, that’s funny, at least it still turned out! Oh no! This looks SO DELICIOUS and I want to make it right away, but I’m stuck with no way to pick up cream or half & half. Is there some kind of milk/butter combo I could use that would work? If I don’t have 8 hours to cook it can i do it on high for less time and it still be good?? Yes it would be fine! I’d do 5 hours on high. We can’t get creamed corn in Denmark – how can I substitute it? Hi Maria, could you blend up a can of corn slightly? With a splash of the liquid from the can. That would work fine. Yes I could easily do that! The potatoes won’t turn to mush being in the crockpot for 8 hours? Not at all. They are just getting done getting tender at 8 hours. Hi Sarah, this chowder comes out thin for me, is there any way to thicken it up just a little? Thanks! !